Here is the final part of Shankar’s story. I hope you found this interesting and enjoyed his unique writing style. Stopping briefly for a quick bite and some Coke and so on for our caddies, we went across to the West course for our second half. Fortified well by the rather excellent snacks available at the golf hut, we quite possibly were a little over-confident on our 10th hole, (the first hole on the West Course), a par 5, 499 yard monster, causing both of us to double. The 11th and 12th holes passed without much incident and then we were onto the 13th hole, which is a 128 Yard Par 3 where I managed a bogey despite having gone onto the left of the green. This hole is an absolute beauty sitting right there, guarded on all sides by little knolls of grass, with water on the right of the fairway and surrounded by no less then 4 bunkers of varying sizes, shapes and depths, beautifully inset into the little grassy knolls themselves! The 14th is quite capable of dealing you the card saying death by water if you are not careful because some low-ish mounds bound it on the right, effectively concealing the lurking threat of the waterway on the right! The 15th is a long par 5 of 529 yards – very difficult so don’t ever underestimate it! Absolute hell, believe me. The 16th is pretty straightforward and a 358 yard Par 4, well met with a Driver, 9 iron and Approach Wedge for Par. Onto the best hole of the day, the short Par 3 17th, (8th hole of the West course), which has deep water on the left side and in front between you and the green with a tough rough on the right. Two levels of Tee Box (see insert left), meet you when you attack this hole. You can either play an 8 or 9 Iron from below if you feel confident, OR, as we did, you can play a 7 Iron from the Upper Tee, a turf-lined, concrete platform that serves as a roof to the lower tee box. Wonder of Wonders, both of us were on the green in regulation and went for the most pleasurable par we made that day! The Par 4, Eighteenth hole again was rather deceptive. Keep left is the motto here, in order to remain on the fairway. Since it was the last hole for the day, I thunked my Driver down for a beautiful shot (or so I thought) heading slightly to the right, landing well on the springy fairway turf, only to bounce once, twice and SPLOTCH! over the last restraining knoll, off the steep fringe, into the water body that guards (and very effectively too), the 18th island green. Finishing with a Bogey despite a dropped stroke here was to me, an achievement in itself! Then, four hours and about 6000 odd yards after we had begun it was onto some sorely required refreshment and a round of their excellently appointed Pro Shop to buy some little souvenir caps and tees and so on, for keepsakes and to top off our visit! Thus ended another wonderful and enjoyable round of Golf and most importantly a round on a Monday, dull and dreary working day that it normally is! Enveloped in that dull afterglow of euphoria combined with the disappointment of having to tear one’s self away from such a nice environment, prior to packing one’s bags and leaving for the grind of daily working life at home, we drove slowly back to our hotel. 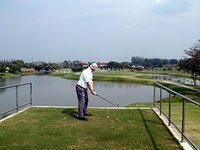 Since the pretty little Kingdom of Thailand is superbly equipped in terms of facilities and just brilliantly geared to meet all the needs of the enthusiastic Golf Tourist, it should certainly take pride of place on one’s list of “must visit” golfing destinations, if one is a dedicated golfer with a bit of a passion for travel as well. Indeed there are in excess of 50 or 60 world class Golf Courses/ Resorts/ Country Clubs in and around Bangkok City itself, located at varying distances. This is to say nothing of the other places there like Pattaya and Phuket and what have you! Highly enjoyable and heartily recommended, is my considered view! Thailand Back Breaker or Great Golf Tip To Ensure Consistency?